A while ago I promised some paper-related photos from my husband's trip to Japan. Here are shots of breakfast one morning.... you can see a lovely folded piece of paper holding vegetables and tofu. (And lots of dishes! Can't imagine washing that many each morning.) Beautiful, no? I love Japanese attention to detail; even the corners are punched. He had mentioned that the paper was balanced over a small flame, similar to Sterno pots that are used for serving buffet-style here in the States. So, I wondered... just how does the paper not catch fire? Of course, silly moi - liquid was involved. Because the paper isn't heavy, heat is quickly conducted to water inside the paper and the food cooks without disaster. Inspired to do some googling, I found other cooking techniques in Japan that involve paper. One is called kami-jio, or paper salting. This is a method of bringing a light, salty taste to raw fish used for sushi or sashimi. 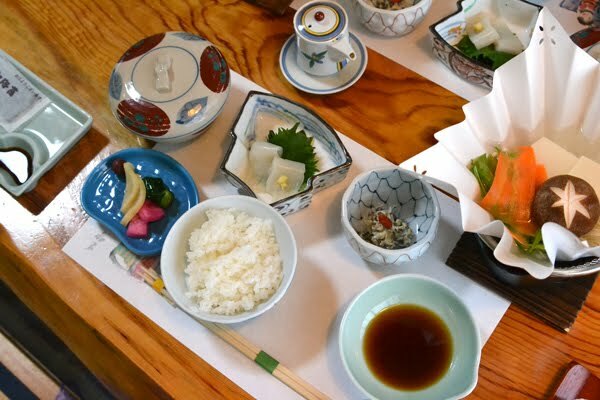 A board is sprinkled with salt and a dry sheet of washi paper is laid on top of the salt, then the fish is placed on the paper. Another sheet of paper is placed on top of the fish and this "sandwich" rests for up to an hour, during which time the moist fish absorbs a subtle flavor from the salt. An absorbent paper towel can be used instead. I'll have to try this! They also use something called cedar cooking paper (above picture), but it's actually a very thin sheet of cedar wood, not true paper. A square is soaked in water for several hours and then wrapped around poultry, fish, and vegetables before grilling or baking. I'm conjuring up the aroma of freshly cut cedar and can imagine the wonderful flavor it imparts. Cedar packets are sometimes spritzed with white wine or sake and with that, my foodie pals, the tastebuds are tingling. Sometimes stars really do align... with Easter brunch right around the corner, it was the perfect time to come across these bunny cube muffins. The combination of Japanese origami with the French cooking method, "en papillote", (in paper) couldn't fit into this post any better. Parchment paper is folded to create a small parcel in which ingredients are essentially steamed with their own moisture when placed in the oven on a baking sheet. 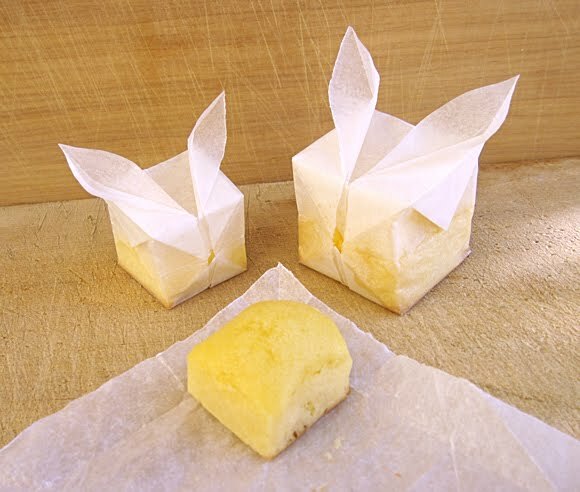 Find full instructions for cream cheese bunny muffins on the clever blog, Eye Candy. And last but not least, here's a zany, little video that shows how to make an origami Japanese cooking vessel. It goes way too fast to follow the steps, but the result is so darned cute, you can always skip ahead to the end. Such elegance in what looks so simple. I love the sound of cream cheese bunny muffins, and they're super cute, too! How fascinating! You find the most amazing things. very interesting, glad you shared it with us! that is fascinating that you can have that paper over a flame without it burning. Love those bunny cube muffins. beautiful! the paper related incident i remember most clearly from my own trip to japan was in a department store, where i was purchasing a little trinket. the young sales woman found the proper box, and then grabbed a piece of gorgeous paper. she then started wrapping it, but kept struggling. finally she called over an older much more experienced sales woman who showed her the proper technique to fold the wrapping paper around the box. the whole thing easily took 10 minutes and the wrapping was ingenious, on an angle and all cool and folded looking. i was really impressed at the amount of effort just in wrapping up a package for sale, this wasn't even gift wrapping it was the standard thing they did for everyone!! i cannot get over HOW CUTE this eye candy blog is!!! did you see the little chicky cheese ball and tomato picks?? i love love love them! the notion of cooking with paper is both terrifying and intriguing. i would for sure burn my place down. i LOVE this post, ann! (ok well i love all your posts really) it makes me want to bake things in paper bunnies ALL DAY!